I’m eating well. I’m getting so used to Thai cuisine that my stomach didn’t feel well recently after eating a cheeseburger and French fries and drinking two cups of coffee. More importantly, I hadn’t had any rice. Thai food is delicious, but I’m figuring out what I like and don’t. Perhaps I should say: I’m figuring out what I can handle and what I can’t. Some things I eat and think, I could eat this every day – and I do. 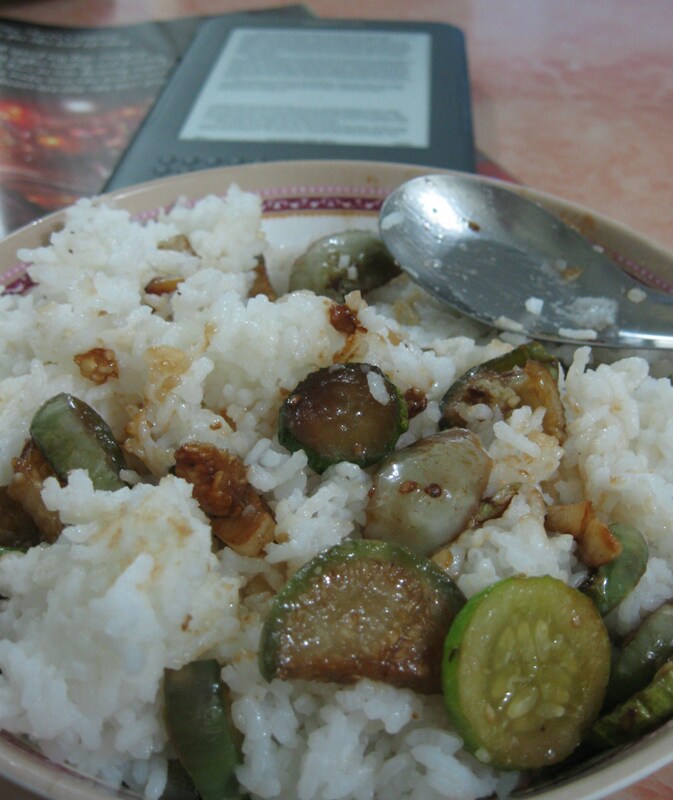 Then there are things I look at and wonder how the Thai people can eat it as often as they do and yet remain healthy. This was more of a case when I was in training and lived near a busy amphur (city) where it was easy to go to convenience stores that have plenty of junk food. I’ve been told I’ve lost weight. I have not. However, I think I have slimmed down even more. There is less fat on my body and more muscle. I weigh myself at the health station every week and it’s the same as when I left the states. I exercise every day and no longer have three gallons of 2% milk a week, bread and bratwurst, not to mention the evenings on the couch with a movie and a bag of Old Dutch French Onion ruffled potato chips and three bottles of Rolling Rock. I’ll do my best to portray what kind of food I consume on an average day. Keep in mind that rice is involved in every meal. I’ve tried to think of an American equivalent to rice and there really is none unless you wanted to say we always eat with a fork. That’s how often Thai people eat rice: as often as Americans eat with a fork. I should also mention Thai people don’t eat with forks. Forks are sometimes found at the meals, but they’re merely used to scoop food onto the spoon. Eating food from your fork in Thailand is like eating with your knife in the states. Most Thais like their food spicy. Here’s my stance on spicy food: my mouth is okay with it, but my stomach isn’t. There are many levels of spice in Thailand and the Thais view of them is different from mine. I have to double their view of it, normally. If they say it’s not spicy, many times it is a little spicy. When they tell me it’s a little spicy, it’s plenty spicy for me. When they tell me it’s very spicy, it likely has the chance to melt my face off, much like the climactic scene in Indiana Jones and the Raiders of the Lost Ark when the ark is finally opened and the Nazis’ faces melt off like a plastic bottle in a campfire. 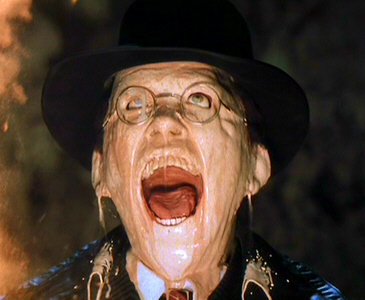 Either this man just looked at the lost ark or ate some really spicy Thai food. There’s good reason fried rice tastes so good: it’s fried. Thai people like to warn me if I eat a lot of fried rice I’ll get fat. Little do they know of my Jackson-inherited metabolism. In fact, I do eat a lot of fried rice, but I do something the Thais don’t – exercise. I like my coffee black. Some call it cowboy style. I call it delicious. When I was given my first cup of coffee prepared by a Thai I was afraid I’d get diabetes. Thais like their food to the extreme: spicy, greasy or sweet. I can see why they don’t eat hamburgers – too plain. In fact, there is a diabetes problem in Thailand. The first time I went to the local anami (small hospital/clinic) I asked if they encourage exercise to diabetes sufferers. No. Surprisingly, when I’m in bigger cities, I do notice a good amount of obese Thai people (nothing compared to the food courts of various American cities). I don’t notice them in the more rural parts of the country, where there are no convenience stores to buy junk food. The Thais love their cucumbers and I love them for it. I’ve eaten more cucumbers in my four months here than I did in my first 32 years in the states. Thankfully, Thais also love vegetables and fruits. I was never much of a fruit eater in the states (much to my mother’s chagrin), but I eat it all the time here. Ironically, I’m also taking multi-vitamins regularly for the first time in years even though I probably need them less than ever. There’s a huge variety of fruits and many of them aren’t in the states, so they’re difficult to describe. I can say that the appearance of many of them scared me until I tried them. I haven’t exactly learned how to cook Thai-style yet. I’m pretty much doing the same I used to do in the states: gather my favorite ingredients and throwing them in a pan. The main difference is I’m eating them with rice. When I do escape to larger cities like Bangkok and Surin, I seek out foreigner food like pizza, hamburgers and real coffee. I do dream of Mogie’s Garcia burger and pizza in Chicago from time to time, but I’m eating well in Thailand and probably healthier than I did in the states. P.S. I miss eating with you.